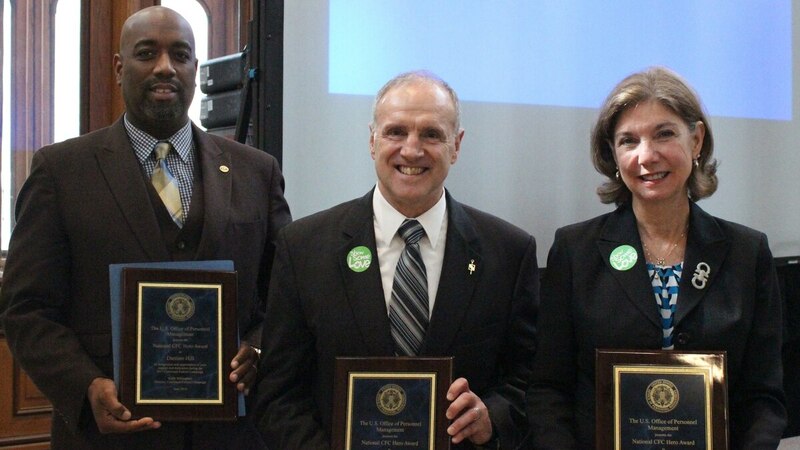 The Combined Federal Campaign of the National Capital Area celebrated three heroes of the 2017 charitable giving season at its annual leadership conference Sept. 20. Each CFC region is allowed to submit three nominees to the Office of Personnel Management’s Hero Awards, which celebrate the “unsung heroes” whose leadership made a significant difference in the previous charity fundraising season. A new platform is debuting for the fall 2018 Combined Federal Campaign to make it even easier for men and women in federal employment give generously to the causes they support. For 2017, all three of the CFCNA’s nominees were selected to receive Hero Awards. As co-communications coordinator for the Farm Credit Administration, Hill created and hosted a mock telethon, complete with a phone bank, performances, advertisements from charities and a self-written rap to encourage people to donate. Hill also created a cancer awareness photo shoot, called Color Rush, to encourage employees to dress up in support of cancer research. “Damien arranged, through his hard work for FCA — Farm Credit Administration — to have 50 percent employee participation, which is a testament to what he does and the energy they have in that campaign,” said Vince Micone, chair of CFCNA. Neumeister, the campaign manager for the DHS Management Directorate, executed several CFC events, including a talent show and a virtual charity fair to drive donations. When a snowstorm delayed the government opening on the day of a charity fair, Neumeister and another executive interviewed and wrote up the mission of each charity and adapted the event to a virtual charity fair with information distributed to all employees. “Mouse actually was my campaign manager for the area that I worked last year, and he built a sense of energy around the campaign like none that I have seen,” said Micone. As campaign manager for the Office of the Assistant Chief of Staff for Installation Management, Fowler successfully engaged with her command structure to develop a communications plan that included messages from leadership and updates on campaign progress. Her efforts drove CFC donations that well exceeded established goals for 2017. “Gail worked so hard that her component gave 150 percent of its goal last year,” said Micone. While celebrating the achievements of the past season, the CFCNA conference also emphasized the improvements to and goals for the 2018 season, which began Sept. 10 and runs through Jan. 11, 2019. The website for pledging donations was updated for 2018, including easier search functions, the ability to allocate funds by dollar amount to each charity rather than by percent, the ability to make multiple kinds of pledges through one donation account and an enhanced focus on federal retirees and new employees. “People who are former federal employees, retired federal employees, they still have that dedication to public service. And we’re very excited that we can engage them, working with current feds to give and to volunteer with these organizations,” said Micone. At the event, OPM Director Jeff Pon celebrated the updates and the federal commitment to expanding their service to their communities beyond their government jobs. “This program, CFC, it embodies some of my priorities as director of OPM. One is digitization, getting out of paper, making sure that we modernize the way in which we work,” said Pon. Last year, CFCNA raised $38.7 million, contributed 45,000 gifts, and made a commitment of 50,000 volunteer hours. According to Micone, the region is setting a goal to equal or surpass that amount by raising $38 million to $40 million for 2018. “We want to go up in every single mark. We want more gifts, we want to raise more money and we want to have more volunteer hours,” said Micone. Donations made through CFC dropped overall from 2016 to 2017 — from $167 million to $101 million — which Micone attributed to the intensity of the 2017 hurricane season. “Last year we need to keep in perspective. When the hurricanes hit, OPM was conducting a special drive for federal employees to contribute to hurricane relief that was separate from the CFC. So the CFC started a little later, and federal employees were encouraged to give to disaster relief because of the enormity of those storms,” said Micone. Jody Olsen, director of the Peace Corps and honorary chair of CFC2018, expressed her confidence that the 2018 campaign would surpass previous years’ contributions. “You work hard, you make a difference, and you’re going to make a huge difference over these next three months. And we’re going to exceed the campaigns of the past because of every single one of you,” said Olsen.